Tastings are no longer just for wine anymore. Over the past 10 years or so, a variety of craft breweries, distilleries, and cideries have sprung up in Centre County and become a big part of the local food and beverage scene. To show off this local beverage bounty, the Central PA Tasting Trail was developed out of an initiative by the area’s craft beverage community to unite and promote these businesses to locals and visitors alike, with the goal of gaining exposure for the craft beverage industry within Centre County. While many people are surprised to see white whiskey, the color that everyone has in their mind when they think about whiskey comes from the aging process, Rogers said. Since the distillery has been open only since July 2014, there’s still time needed for aging. She said that in several months, they’ll have their first batch of bourbon, aged rye, and aged wheat whiskey that has been aged two years. In the meantime, they offer the other spirits to get their cash flow going. Along with Big Spring, the members of the Central PA Tasting Trail include Barrel 21 Distillery & Dining, Elk Creek Café + Aleworks, Good Intent Cider, Happy Valley Brewing Company, Happy Valley Vineyard & Winery, Keewaydin Cider Mill, Mount Nittany Vineyard & Winery, Nittany Mountain Distillery, Otto’s Pub & Brewery, Robin Hood Brewing Company, and Seven Mountains Wine Cellars. All offer unique tastes on the Trail, but Big Spring and the other distilleries have a unique challenge; they can only serve the spirits they sell. For a distillery, this means they have to serve a dry martini since they cannot serve vermouth. “It forces us to be pretty creative cocktail-wise,” Rogers said. 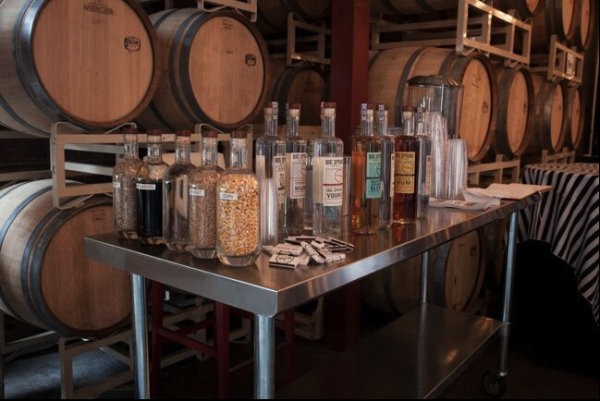 Along with the interesting cocktails, great beer, tasty ciders, and wonderful wines, as you tour each location along the trail you will get other benefits. Participants get their “passport” stamped to verify each location visit. Once you’ve completed the entire Central PA Tasting Trail, you then submit your ticket to one of the participating venues for your chance to win prizes during a drawing in May. “The more you support us the more we support the local economy, so our success is good for the whole community,” Rogers added. To find out more about the Central PA Tasting Trail visit the Central Pennsylvania Convention and Visitor’s Bureau’s Tasting Trail page at www.centralpatastingtrail.com.